Written and POSTED BY ALEX. March 5, 2007 for "Syria Comment"
President Bashar Assad spoke about the historic relationship between his father, late president Hafez Assad, and King Abdallah. He spoke about the personal respect he has for the Saudi king and for the significance of Syrian-Saudi relationships. After a meeting with the Saudi envoy to Damascus, a marked change in the tone of Syrian media outlets has been discernible. Many journalists, from both state-owned as well as privately owned media outlets, were criticized by government agents for their previous criticism of Saudi role. In sharp contrast to the general movement towards Syrian Saudi reconciliation, prominent Saudi journalist Mr. Abdul Rahman Al-Rashed, director of Al-Arabia Satellite TV station, and ex-editor of the largest Saudi owned newspaper Al-Sharq Al-Awsat, wrote today an exceptionally negative piece on Syria. He even ended it with a strong warning. – The assassination of Rafiq Hariri which was “the biggest shock to Saudi Arabia” because of Saudi suspicions that Syria was behind the assassination. – The language used in the Syrian president’s speech who surprised all the Arabs with his attacks on Saudi, Egyptian, and Jordanian leaders. – Vice president Sharaa stating that there is a personal component to the Saudi leadership’s problems with Damascus. – Syria’s support for Lebanese opposition in their attempts to undermine the Seniora government. – Syrian attacks on the PLO forces during the early stages of Lebanon’s civil war. – Syria’s decision not to side with Saddam Hussein’s Iraq in his first war against Iran. Syria’s actions over the past two years have been bewildering, Al-Rashid insists. Syria destroyed its most significant alliance in the region (that with Saudi Arabia). As a result, Syria became exposed to “internal, regional and international hazards”. This is how he perceives the state of Syria prior to the upcoming Arab summit. He explains that political differences among enemies are never impossible to fix, so it should not be impossible to do so among brothers. But Syria will be mistaken if it believes that its disagreements with Saudi Arabia are based on personal issues. The way Syria opened the door for Iran into Iraq, Syria, Lebanon, and the Palestine is not a simple matter… it changes the map of the Middle East and it leaves the door wide open to a major war … with sectarian, security, regional, and international aspects. The article is concluded with a warning: If Syria does not take steps to fix the causes of its problems with Saudi Arabia, then the Arab summit will not save Syria from a dark future ahead … Syria is responsible for its own encirclement. What exactly does Saudi Arabia stand for? It is obvious that Syria cannot please all the Saudis all the time… Saudi Arabia has many, often contradictory requirements. Saudi journalists have been critical of the Syrians for many reasons: Syria is not democratic; Syria is giving a role to non-Arab and non-Sunni Iran in Arab affairs; Syria is helping the Iraqi Sunnis; Syria did not expel the leader of Hamas from Damascus, when the US insisted that he do so. Later, the Kingdom seems to have reversed its positions on these same issues. Just like Syria, the Saudis warmly welcomed Hamas leader Khaled Mashaal in Mecca, and closely coordinated with Iran officials their joint proposed solutions to many Arab conflicts. What is it exactly that they still do not like in Syria's behavior? The lack of Democracy? Mr. Al-Rashed’s argument that during the past two years the Syrian regime has made many mistakes leading to an unprecedented deterioration in Syrian Saudi relations in not entirely convincing. The death of Hafez Assad and the demise of Iraq’s strong man, Saddam Hussein, created a perceived "leadership gap" in the area. America, Saudi Arabia, and Iran competed to fill the vacuum. Those presidents and kings who attended Hafez Assad's funeral in 2000 all wanted to change Syria's traditional role in the region. They believed that they could take the young and unproven Bashar al-Assad under their wings and direct him to abandon Syria's positions on Palestine, Lebanon, Iraq and Iran. President Bashar al-Assad turned out to have a mind of his own and refused to cooperate with the KSA, France or Jordan, causing grave concern about his leadership abilities. The first real test for Bashar al-Assad was the US invasion of Iraq. His refusal to cooperate with America's invasion meant Syria was elevated to the status of an adjunct participant in the "axis of evil." 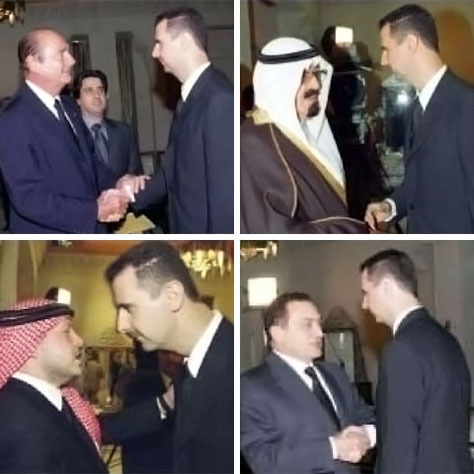 Here are photos of the presidents and kings who attended the funeral of Hafez al-Assad in 2000. Rather than supporting the US in its invasion of Iraq, both Syria and Iran competed with the Untied States to share the Iraq pie. Syria and Iran made gains in Palestine through their Hamas allies. Saudi Arabia, the U.S., and the French took Lebanon away from Syria and probably had plans to "change Syria's behavior", preferably through regime-change in Damascus. Because of the lack of a better candidate, ex-Vice President Abdul Halim Khaddam was floated as a possible alternative president for Syria. He is known to be a friend of President Chirac, King Abdallah, and the Late Rafiq Hariri. Thomas Friedman’s syndicated columns are translated every week and published in the Saudi Al-Sharq Al-Awsat. A few weeks ago his column did not appear in the Saudi paper, however. In that column he explained his preference for Iran over Saudi Arabia as the more natural future ally of the USA in the Middle East. The Saudis are worried that the Untied states will eventually talk to Iran. When this happens, there are many reasons to believe that the Americans will rediscover the tremendous utility of Iran. Should Washington find common ground with Tehran, it will be at the expense of Saudi Arabia’s exclusive role as US ally and heavy hitter in the Middle East. Today’s article by Mr. Al-Rashed reflects Saudi fears, which are mixed with self confidence and even arrogance. The kingdom is feeling both powerful and vulnerable at the same time… just as Syria and Iran do. Hopefully, at the upcoming Iraq round-table meeting, all the competitors (The US, Saudi Arabia, Syria, and Iran) will find a way to reach an acceptable compromise over who will play what regional role for how long and towards what purpose. It seems that Syria’s request that the meeting not restrict discussions to the subject of Iraq will be accommodated, if not at the table, then through the Iranian/Saudi negotiations in Riyadh and elsewhere. For example, a new Lebanon agreement seems to be in the making. Syria has already given the Saudis a gift by facilitating the Mecca agreement. A lot more give and take can be expected. Still, coming to total agreement will be difficult, if not impossible. There are too many players sitting at the table and there are too many conflicts to be managed. Hopefully, the competing powers in the region will have the wisdom to diffuse the simmering conflicts that threaten to drag the region into another round of blood letting. Much hangs in the balance during the next month of conferences and negotiations. Alex is lamenting the fact that a so-called ‘positive’ article towards Saudi Arabia written by a Syrian regime mouthpiece Mr. Ibrahim Hamidi is reciprocated by a negative article from the Saudi side. This is typical Baathist ideologue behavior: I launch a media campaign against you hoping that you may show some signs to talk (in this case the latest Saudi invitation to Bashar to attend the Summit in Riyad). When I get the sign, I order the government mouthpiece to reverse its propaganda until the talks begin. I go to the talks with a set of demands expecting them to be met just because I ordered my media outlets to stop attacking you. Very simple? No issues to discuss nothing: Forget about the Gaza war in the summer. Forget about the Hezbollah fiasco which followed. Forget about the Iraq subversions. Forget about the International tribunal. Forget about failed attempts to destabilize Lebanon and arming of Hezbollah. Now I am not producing venom and you are supposed to meet my demands. So politics is all personal with Bashar. I insult you and you insult me. Then we stop insulting each other and you’re supposed to pay me. Here we have a dedicated arsonist playing with fire for the last few years seeking all of a sudden to play a role of a statesman and with no prior experience save a full resume of subversive activities. Did we see that happening in 1930-39 somewhere in Europe? The price he wants to pay for his role is a simple command to his mouthpiece to reverse the production of venomous propaganda! It’s so hypocritical that the U.S. is simultaneously launching a “war on terror” and sponsoring an arrogant Saudi Arabian regime that sponsors salafi jihadists and Wahhabists, while doing next to nothing for Palestinians or Lebanese. It seems that their utmost priority is retaining their own power, and the Saudis, like the Americans, fail to realize that power depends not on force but on legitimacy. I applaud Syria for opposing the Iraq invasion, while the Saudi regime cynically played along and does nothing to prevent millions of dollars going to Sunni insurgents. At least one side is being honest. you cant ignore that there is something being cooked newly in the region. US ,for the first time in two years (I think),wants to talk with Iran and syria, although claiming that talks are strictly about Iraq. In this situation, even limited negotiation about Iraq represents something new in US administration position. Also , sending Saudi envoy to Damascus and the Egyptian effort to narrow the differences between Syria the Saudis cant be ignored. do you think after all this bashar will go to the Arab summit to accomplish nothing? no deal? i think there will be some compromise from both sides, but what is it about I don’t know..anybody? I second Gibran. Syria thinks it can sell water to turn off fires it starts. وبرغم أنه تم الاتفاق على أن تقدم الأسئلة والمداخلات مكتوبة إلى المتحدثين في الجلسة الختامية إلا أن الموالين للنظام السوري وبينهم وزير الإعلام السابق عدنان عمران ورئيسة الاتحاد النسائي سعاد بكور والنائبة في البرلمان السوري ابتسام صمادي بدأوا في الصراخ والشغب داخل القاعة لانتزاع الرد بالقوة ولما تم لهم ذلك قال عمران أن جميع السوريين الذين يقيمون خارج وطنهم إما هاربون من الخدمة العسكرية الإلزامية أو متورطون في جرائم ضد الوطن. We demand an apology form this Ammran man. We need to see a press release form the Expatriate ministry insuring that this is NOT the view of the Syrian government toward the syrian Expatriated citizen..
عادت خدمة الانترنت عن طريق شبكة الـ ADSL في معظم المناطق السورية الى المشتركين ، حيث تسببت ورشة لقطع الاشجار بتوقف الخدمة لمدة ساعات منذ صباح اليوم الاثنين . وقال وزير الاتصالات عمرو سالم في تصريح لسيريانيوز بان توقف خدمة الاتصال بالانترنت عن طريق شبكة الـ ADSL سببه قطع الكبل الضوئي المحوري قبل مدينة طرطوس بـ 8 كم” . واوضح سالم بان “انقطاع الكبل اثر ايضا على حزمة الاتصالات الدولية” ، مؤكدا بان “ورشتين مختصتين قد وصلتا الى المكان وهم يعملان على وصل الكبل” حيث لوحظ عودة الخدمة بعد ثلاث ساعات من انقطاعها. وكانت جرافات تابعة لبلدية طرطوس مختصة بقلع الاشجار قد تسببت عن طريق الخطأ بقطع الكبل الضوئي ، اثناء عملها في اقتطاع بعض الاشجار. واشار سالم ان عملية وصل الكبل الضوئي ” عملية صعبة ودقيقة ” وتحتاج الى وقت اطول بكثير من ذاك الذي تستلزمه عملية وصل الكبلات النحاسية. I live in Washington, DC and my cable internet service comes on poles. In the last ten years we’ve lost service because of fallen branches, trees, and the cable being cut by mistake. This is happening in the heart the USA’s capital. It’s hard to believe that poles are still used in a developed country to deliver phone, internet and cable tv service. First of all, Saudi Arabia does not employ, arm or export terrorism like the Iranians and the Syrians do. Get your facts straight. Can the Saudis do more to ensure their money doesn’t get into the hands of the wrong people, including madrassas and mosques that preach hatred? Yes, just like every other ME government can. Duh! However, you can keep America out of this argument. Our congress is consulted for every major decision, including regime change in Iraq and/or funding our troops. Meanwhile, Saudi Arabia and the US are legitimate countries – there is no argument there. Syria “opposed” the Iraq invasion? As I recall, Syria signed UNSC Resolution 1441. And “serious consequences” is exactly what the doctor ordered. Syria, to date, has been betting on the Iranians, jihadis and the Palestinian terror groups. Obviously, Syria (like Arafat) believes terrorism and instability is the best way to ensure their hold on power. American success confronting these governments and organizations will dictate whether or not Syrian policy will change. How do you like it when Saudi Arabia got upset at Hafez Assad because he did not support the PLO at the time in its state within a state actions in Lebanon? And .. are you saying that Syria supported the war on Iraq? when did you start defending Saudis? duh..they don’t arm “terrorists” , but they supply money.. I dont need to tell you that fundamentalism started in KSA somehow!! where do you think all radical movements get their money from(apart from syria and iran ;))? My point is much more subtle than what you think, Akbar. It’s this: Syria from the beginning told the U.S. not to invade Iraq, as it would be disastrous. That was good of them, to give us prudent, wise advise, even if it was ignored. Saudi Arabia, on the other hand, does a double-act: they pretend to along with the Iraq war, while their citizens send millions of dollars to Sunni insurgents and while Sunni clerics label Shias heretics. Saudi Arabia actually DID fund terrorism, against the Soviets, and these are the same people who came back to fight against them and the U.S. The conflict is now now against communism but against neo-colonialism. While I applaud Saudi Arabia for taking a more active diplomatic approach as of late, one cannot simply ignore the fact that because they have repeatedly gone along with U.S. plans in the region (first against the USSR, and now against Iraq), this has caused a surge in terrorism of the salafist and Sunni variety. I mean, really, do you think the clerics in Qom are telling the Sunni Muslim terrorists from Algeria to Iraq to wage their defensive jihad? You get your facts straight. edit: I should add that the conflict is not against “neo-colonialism” per se, but that that is how it is perceived in many corners in the region, in the same way that the previous campaign was seen to be against Communism. It specifically talks about the articles that seem to upset (I mean Al-Rashed and others). It is also an excellent realistic reading for everyone else. I hope that answers the less than obvious question you’re asking me Alex. كيفما جاءت نتائج القمة السعودية – الايرانية، هناك ثابتة اساسية لن تتبدل سريعا : انتهى عصر بسمارك العرب. والاشارة الى بسمارك العرب هي بالطبع اشارة الى الرئيس السوري الراحل حافظ الاسد الذي لقبه بعض الصحافة “بسمارك” العرب نسبة الى رجل الدولة البروسي الذي وحّد الامارات الالمانية المتناحرة الثلاثمئة، وقاد المانيا الموحدة الى الانتصار على فرنسا نابوليون الثالث في حرب 1870، سالخاً عنها مقاطعتي الالزس واللورين. حصل حافظ الاسد على لقب بسمارك العرب في شكل حاسم ونهائي غداة استيلائه على لبنان نهائيا عام 1990، وتكليفه تنفيذ اتفاق الطائف حصريا. وذهب بعض المغالين في تلك المرحلة الى اعتبار ان حافظ الاسد استطاع بعد 75 عاما تمزيق اتفاق سايكس – بيكو والثأر لسوريا الكبرى التي سلخت عنها الاقضية الاربعة وجبل لبنان نفسه. وفي نوبات المغالاة تلك الايام، قيل ان قطار الوحدة العربية انطلق من ضم سوريا لبنان عمليا، ومن نجاح الاسد في تجميع العديد من الاوراق الاقليمية بين يديه ليرسخ القاعدة “الامبراطورية” لسوريا الاسد. بمعنى آخر، انه نجح في اطلاق مرحلته الامبراطورية بدءا من “جوهرة تاجه “، لبنان. عندما ورث الرئيس بشار الاسد سوريا ولبنان عن والده عام 2000 بعد الانسحاب الاسرائيلي، لم يرث “المانيا موحدة” على الطريقة البسماركية كما بدا، وانما ورث عن ابيه ملكا شبيها بالامبراطورية النمسوية في مطلع القرن العشرين، والتي كانت مؤلفة من النمسا والمجر، وكان انفصالها مسألة وقت، جاءت الحرب العالمية الاولى لتعجّل خطاها وتنهيها. شكل العمى السياسي لبنانيا واقليميا الذي اصاب القيادة، عامل التعجيل الاساس في فكفكة مُلك بشار الاسد، فعمدت الى المبالغة في تشديد الطوق حول “جوهرة التاج” باعتبارها ارضا مفتوحة من دون ضوابط. والمهم هنا ان قرار التمديد للرئيس اميل لحود والذي لا يختصر وحده مسلسل الاخطاء، بني على قاعدة ان لبنان كان في طريقه لأن يصبح اكثر اندماجا بسوريا، وصولا ربما الى اعلان كونفيديرالية بين البلدين تمهد بعد سنوات عدة لاعلان الوحدة النهائية. (كشفت مقالات عدة كتبها في سنوات بشار الاولى مسوؤل امني سوري في الصحافة اللبنانية، بعضها كان موقعا من نائب سابق، عن مشروع الكونفيديرالية). ولما كانت السمة الاساسية لتلك المرحلة هي العمى السياسي، فقد جاء القرار 1559 معلنا ارادة دولية جامعة لإنهاء امبراطورية حافظ الاسد، واشارة الى ان الرئيس الوارث صار عليه ان يقود بلدا مطبّعا يمنع عليه التمدد. لم يقرأ الاسد والقيادة الرسالة فتوغل في المغامرة وصولا الى اطلاق مرحلة الدم، وكانت ذروتها اغتيال الرئيس رفيق الحريري. وبسرعة قياسية إنهار مشروع حافظ الاسد الامبراطوري في شوارع بيروت. وانسحب الجيش السوري بالطريقة التي نعرف، وبدأت مرحلة الدفاع عن النظام نفسه، التي وإن تكن المظاهر الحالية للازمة اللبنانية توحي العكس، فإنها لا تزال حاضرة وبقوة. فحضور النظام السوري الفعلي في المعادلة الاجتماعية في لبنان ضامر، وهو الى ضمور اكبر يوما بعد يوم. ورافعته الفعلية هي الذراع الايرانية السياسية العسكرية، بجمهورها اللبناني المتجذّر في طائفة اساسية. ولا يحتاج المراقب الى كبير عناء ليتبين له مدى هامشية القوى الملتحقة كليا بالنظام السوري. في حين ان النظام الايراني يمسك بورقة الوارث الشرعي لسوريا في لبنان “حزب ولاية الفقيه”، طبعا مع فارق جوهري هو ان الحزب المذكور موصدة في وجهه ابواب التسلل في ثنايا التركيبة اللبنانية بخصوصياتها، وتاليا تتعذر عليه السيطرة عليها مهما قويت شوكته الحربية. بكل بساطة، للاضاءة على الصورة في الرياض منذ البارحة: بشار ليس في الصورة. هو يستطيع ان يفجّر ويعرقل في لبنان قدر ما يشاء، لكنه في النهاية فقد الصدارة الفعلية للحدث الاقليمي. Those who knew Hafez Assad would have told you that he did not care for being called “the Arab Bismark”. 2) When Iraq annexed Kuwait Hafez took a clear position against it, committing publicly to not supporting such actions. 3) When Arafat’s PLO in 1969 tried to challenge the Jordanian government Hafez opposed his government’s support to Arafat .. which partially led to Assad’s “corrective movement” .. his decision to take power in Syria. 4) Again, he resisted Arafat’s PLO in Lebanon when it tried to establish a state within a state. However, it is true that the case of Lebanon is different. It is a bit like the case of the Alsace-Lorraine in France. Lebanon had always been considered part of Geographic Syria as you know, so Assad probably hoped that Lebanon will one day have more special relations with Syria… but never through annexation. He was too smart to believe that these things work. I bet you The Writer of that article has written it after a few Arrak glasses, or a couple of Lowebrough bottoles maybe. He fell upon the word Bismark somewhere, and thought he has landed something “oiginal”. Oghigeenaaal, I mean. God bless their Hearts, some of our Lebanese brethern, they never let one down, do they? P.S. I am glad Gibran missed today’s article about Jameel Al Sayyed. He would have hit the roof in joy if he had come across it. And I would not tell him where it “smiltanuously” appeared by mere chance! If the late Hafez were to wake up from his grave, how do you think he would assess his son’s past 7 years in office given everything that has happened? 2- What the hell did you do? I agree with your suggestion to Alex and I promiss you that from now on I will not live in fear of Lebanon trying to ANNEX Syria. AP, KSA is the biggest supporter of Hamas to this day – more than Iran and Syria combined by orders of magnitudes. Payments are being made directly and indirectly. It is a known and documented fact where you work. And, um, Hamas is democratically elected. Are you Akbar serious? Does Iran provide the money and weapons to the Iraqi Sunnis? Come-on, why on earth would they make that. So it leaves the question where the money and weapons come? Hardly in massive amounts from Syria because then it would fight against the Iranian (Shia) interests. From which country comes Osama bin Laden? Who financed and provided armament besides USA to Al Qaida in the beginning of that movement? Where the 911, 711 or Madrid men from Syria or Iran? And lets not forget Akbar Israel’s own “terror” past and present. We can read from Amnesty’s site: The report, Dead on Time – arms transportation, brokering and the threat to human rights,reveals the involvement of arms brokers and transporters from the Balkans, China, Israel, Italy, the Netherlands, Switzerland, the UK, Ukraine, United Arab Emirates and the USA. It also shows how this network of middlemen has made it easier for the major arms suppliers to target developing countries, which now absorb over two-thirds of world defence imports, compared to just over half in the 1990s. Hmmmm I can’t find in the main list Iran or Syria. The actual report even does not use the word Syria. Israel is mentioned far more often than Iran. Leonid Minin is not Iranian. And let’s not forget how Israel made dollars by selling weapons to Iran. I think that Hafez realized that he could not live long enough to leave things in an easier state for his inexperienced son… so he knew it won’t be easy for Bashar… Hafez knew what Chirac, Abdullah, Hariri and Khaddam had in mind, and he knew his son will disappoint them at some point. He wanted him to…. what Hafez did not know was that there will be an American army invading Iraq and promising Syria that it is next on the list… that made it even more difficult for Bashar to handle the point at which he let Chirac and friends know that he will not donate to them Syria’s regional role. What counts is the end … we are not there yet. If you take snapshots of history, they rarely correlate with the end results. Some races are marathons and those who sprint early often run out of energy. But if you see how the Saudis are now imitating Bashar in welcoming the Iranians and Hamas leaders (publicly for the first time) and Hizbollah leaders and the Turks … you have to at least consider that maybe Bashar, despite his inability to look as imposing as his legendary father, is doing something right after all. You know that King Abdallah was the first Saudi King to visit Turkey in decades. What Bush senior maybe saying to Bush junior right now would be more relevant. Something like: And son, do you really think I could not have marched on to Baghdad and removed Saddam back in ninty one? And Bush Jr. would cry: Dad, If you did, I wouldnt have had to screw up the whole world like I did! “what the hell did you do”? The Baker report and the man’s latest speech implicitly did argue some of that. Bolton’s recent frustrations confirmed the same shift that Bush Junior may have decided to embark on. My question was not a trick question. Hafez Senior may well have graded his son a Bravo on everything for all I know. Of course Alex, King Abdallah was waiting for Bashar to show him the way to Ankara and Tehran. He may get lost in the desert. After all he is just a bedouin. And I bet you, Bashar also showed Putin and the new UN chief the way to Riyad as well. Looks like Bashar will do very well as a travel agent or may be as a tourist guide. 1- They started showing clips of military operations against Coalition forces in Iraq by the Shie’at groups (Kattai’b Ali), and MENTIONING that the DVDs were SENT to Al Manar (as opposed to sent to other parties or brodcaste over the web). 2- In a TV discussion-program about Why the US has changed its approach to Syria and Iran.., Mr. Al Jisser, the Editor of the Riyadh AL JAZEERA Newspaper has been on the air for the last half houre explaining ( through a telephone call initiated by him to the station) that the US has decided to CHANGE its failing policy, and has found in the Baghdad Conference a suitable “face-saving” retreat… , sorry, and that the US is HAPPY with those efforts the Saudi are undertaking. Indeed. Dubya did manage to screw up the Middle East into a mess never seen before. Contrary to the dream of the neocons in his administration, Israel and America’s allies in the region are not safer or more secure. If anything, Israel was scarred forever by 3,000 HA fighters, Iran has a huge windfall in Afghanistan and Iraq (they couldn’t have asked for a better situation), and Syria is winning its highly risky bets. What a legacy this W is going to leave. Alex, BTW, the above is an excellent analysis. One point I would add, however, is that what the actions we are seeing today from the movers and shakers in the Middle East is a direct result of the US loosing the war in Iraq. Had the US managed the war with competence and leadership, we would have seen a totally different outcome. Ehsani, I agree. Papa Assad would have given Bashar a Bravo grade with a big deer-in-the-headlight look on his face. I think the question then: Do the Saudis, Chirac, and Americans believe that Bashar is not as stupid as they first thought he is? Chirac is leaving soon. The question is: Saudi Arabia. They are Arabs like us .. emotional and vindictive sometimes. I hope Bashar’s “apology” at the Arab summit will be sufficient for the Saudis .. or that it is an acceptable, face saving way for them to work with Syria again. I am actually impressed with Hosni Mubarak. He understands Syria … He understands the Assads’ and their ways. He has been there long enough to know that even if the Americans and Saudis tell us that Syria is about to be finished, it probably ain’t so. Egypt did not boycott Damascus. Gibran Habibi, didn’t we agree yesterday that we will avoid name calling on weekdays at least? .. can we do without the “regime apologist” for now please? If the United States won the war in Iraq things would have been very different. But we don’t know in which way. The Americans were promising a forced regime change in Damascus. I think that was not going to be popular with Russia or with the Syrian people either. It was also starting be become suspiciously like a “crusade” against Islam (invading the third Muslim country in a row) … I think the Syrians were planning to portray it this way if the US army was planning to move to Syria next. I know, I know… I had your expected comments in mind as I was writing this piece! 2) Change allies when needed, after you secure other allies who share the same national interest like Syria for the next few years. Besides, when some distinguished writer like Abdel Rahman El-Rashed writes an angry and contradictory editorial for Asharq in defense of his Prince Bandar, then it is OK for “Alex” (nothing to compare to Mr. AR) to write Bashar’s defense in Syria Comment in return, no? And, yes Bashar did many “tactical” mistakes … the “half-men” was not needed probably, when he received the Pope in Damascus he should not have made the comment about the Jews who killed Jesus, and he should have said his Damascus University speech much earlier … until then he looked like he is hiding. But Can you tell me the strategic (serious) mistakes he made? Sure Alex you can defend him, it’s your right to do so. But someone needs to be realistic and convincing, so we can believe your defense, yes!! Alex, don’t beat around the bush. “Regime apologist” is not an insult. You have to be able to handle that without whining and ranting. You can call me apologist to the Lebanese government as much as you like and it won’t bother me a bit. You can even attack the government of Lebanon (which you do all the time any way) and still it won’t bother me either. If you have reservations about getting called regime apologist, then the solution for you is not to sound like one! Simple. OK, list for me his strategic mistakes please. And also if you don’t mind, tell us how you define “a mistake” and what would you have done if you were in his shoes at the time. I remind you that killing Hariri is not one of Bashar’s mistakes, until the biggest investigation int eh world finds us a proof one day. And I agree in advance that Lahoud’s extention was a tactical mistake .. he should have found another Syrian ally to replace him and to defend Bahsar’s policies against Khaddam, Hariri, Chirac, Abdullah plans for Lebanon. Also, 1559 should have be taken seriously from the start. Alex, you are right, but I was fanaticizing about a true and competent administration that should have won the war of getting rid of Saddam, listened to its critics and generals, learned from its mistakes, and shed its arrogance. Now it needs Iran and KSA to resolve the problems it unleashed in the area – strengthening theocracies like we have never seen before. What a shameful outcome for the US. I agree, I think a decade from now the blame will be put squarely on the Bush administration, no one will analyze Saudi, Syrian, or Junblat’s roles. I hope the US democratic party (your party) will be able to produce a wiser administration capable of designing and implementing a new strategy that will try to encompass the national interests of all the players in the Middle East. There is not a single potential US President Republican, Democrat, or Independent who could put together an administration as ignorant, arrogant, and incompetent as Bush did. This is not a Republicans vs. Democrats issue, any new president will certainly be wiser – you just can’t get any worse. This Administration couldn’t handle the disaster of Katrina (Brownie, you are doing a heck of a job!) let alone the Middle East. Actually, Republicans are counting the minutes to 2008 faster than the Dems are. I do not share your grading of Bashar. “What the hell did you do” is a question that Assad Senior would have asked his son on at least one big strategic issue. tell us the great thing that Bashar did,did he get rid of corruption, did he spread freedom and democracy, did Bashar return the stolen money he ,his family and his friends stole. he pulled out of Lebanon and now people like Gibran control Lebanon,is it not a grave mistake to let people like Ja’Ja’ free ,and has a voice in lebanon, Ja’Ja’ is a traitor, and whoever likes him should be thrown out of Lebanon, they are evil ,they are not lebanese. Can I say something about what his father would have told him and about Lebanon? I think one of the reasons Syria was forced out from Lebanon is that the Lebanese people knew that Bashar is not Hafez .. I am not sure they would have demnstrated in the hundreds of thoudands if Hafez was there… everyone feared Hafez, not Bashar. But again, tell me (and Atassi too please) your list of Bashar’s strategic mistakes. I won’t necessarily disagree. You notice I am restricting my comments to outside Syria .. regional conflicts. Internally I will agree with you to a large extent although I know it is not easy to do those dramatic changes and creating internal enemies while you have regional enemies as well. I mentioned yestrday that I believe president Hafez Assad should have done those reforms in the nineties when he was in total control of not only Syria, but parts of the Middle East as well … that’s where I agree more with you. Regarding Lebanon, after Harir was killed and they all blamed Syria for it (30 seconds after the crime) and the Lebanese people mostly believed the charges, there was nothing Syria or Bashar could do without spilling Lebanese blood … his army would have had to do a mini massacre … I don’t think you are suggesting that option. As for Jeajea and the other Lebanese warlords … I hope in the future we will see someone like Salim Hoss being the most popular man in Lebanon instead of the clowns. I don’t think you have or will ever have a say in who should be in Lebanon, who should be thrown out of Lebanon and who is a traitor in Lebanon. Geagea is Lebanese and so is Jumblat, Hariri, Jemayel and others. So cool it down nad save your nerves the agitation. You’re underestimating the people of Lebanon and overestimating Hafez (unless you agree with the article that he was a Bismarck). You seem to have denied that not long ago. So when Mr. Harriri was assassinated along with 22 others, the people of Lebanon got magically hypnotized into believing Syria was behind it. I didn’t know you are expert in mass hypnotism. By the way the majority of the people of Lebanon still believe Syria was behind the crime. And that’s two years now since the famous hypnotic incident took place. So what do you think? Can you keep the population of a whole country hypnotized indefinitely? How about we establish the tribunal and try to wake them up? We too hope someone else other than this clown Bashar rules in Damascus, even if he turns out to be an MB. By “We” hope someone else other than this clown Bashar rules in Damascus, even if he turns out to be an MB, do you mean “we” the Lebanese? Why? does it bother you? They’re Syrians after all. If the Syrians choose them freely would you challenge their (Syrians) will? When you write “we”, it makes sense to ask you who is “we”, no? It has nothing to do with bothering me. Well, it shouldn’t make a difference to you who the Lebanese would want to be ruling in Syria? We are two separate countries. No? Of course. I just had no idea that your wishes and hopes represented that of all Lebanese. Yes, WE like to see someone else other than the clown Bashar ruling in Damascus, even if he turns out to be an MB and even if that may bother EHSANI. Nice Ananlysis Alex, if you remember we touched on this a few threads ago! Please note how economic growth in the EU is near to the level the US achieved 20 years ago. The EU’S current per capita GDP was reached by the US in 1985. The EU’s employment rate and level of investment in research and development were reached in the US in 1978. Unlike most of the participants here, who find it easier to label ME machinations in terms of Black and White, I don’t. If Iran is “Black”, the KSA is “Gray”. The Saudis have experience with madmen and terrorists like Sadam Hussein. Also, the KSA has NOT threatened neighboring countries with annihilation like Hamas, Hezbollah, and Iran has. The KSA has taken the role of promoting peace in the region, which relatively speaking, is pretty WHITE in my book. The Saudis didn’t “make” OBL. OBL is a product of Islamic brainwashing which, again, is prevalent in EVERY Arab/Muslim country on the map. There is a fine line in between being a devout Muslim and one who aides and abets Islamic terrorists. Fortunately, now, after a number of years fighting the war on terrorism, this line is becoming clearer and more noticeable. I disagree. Of course the Syrians didn’t want to see a Baathist despot get thown out of office and hang in the wind. But if they didn’t, they shouldn’t have voted for UNSC 1441. I don’t have any statistics on this. Do you? Speaking of “double acts”, the Syrians talk peace while their clients Hezbollah fires thousands of missiles into Israeli population centers. The KSA hasn’t quite reached this level of terror supporting. So did the US. At the time, the US was trying to buy a friendship with the Muslims in their fight against Communism. Par for course in the Arab world: no good deed goes unpunished. I think Sunni terrorists are terrorists. I think Shiite terrorists are terrorists. And I think the Arab and Muslim government should play a constructive role and urge their people to put down their arms, and take the necessary steps to help ensure this. Yes, “perceived” greivances. A fly in my soup. A Jew in my country. I lost my job. ect, etc. It’s all about the Arab/Muslim Press, the Arab/Muslim Media and the clerics of hate. Hmmmm Ehsani2 those statistics depend much about the structure of European Union. As you certainly know EU has taken many new relative poor member states, which undoubtedly lower the EU’s performance. What if USA and Mexico would be united and statistics calculated of that unit? American’s have all the reason to earn more GDP per person so that they can afford their healthcare and university studies. As you know the “socialistic” European healthcare system is far more cost-effective and better performing as the US private version. See the WHO statistics. By the way are USA’s millions of prisoners calculated to unemployed or free labour force? Most European’s are satisfied with the European model. They want to keep their good social security system, free education, good workers rights etc. They do not want the “Wal-Mart” economy model where there are no holidays, no healthcare, no workers rights and a worker has to have several jobs to survive. The diffrence between the american and the EU economies is simmiler to the difrence between the growth company (US ) and a divident paying company (EU) Growth company can grow fater but does not pay dividents while dividentpaying companies are more stable but can not grow and and build wealth , yes in the US we work hard and pay for our healthcare and higher education but our chance of wealth building is much more than in the EU and that is why the weathiest people on earth are in the US ,anybody can get rich in the US if he has an idea or an education and the guts to start a buisness , In the EU people are comfortable they have vacations and free education but never have a chance or as much of a chance as in the US to build wealth. I would rather to be in the US , beside racism is not tolerated in the US as much as in the EU.we all become American when we know the diffrence between the Republican and the Democratic parties. You prefer to be rich to having a better standard of living? makes me feel so ignorant.. interesting piece.. The Future movement strives to contribute to the construction of a modern, just, and democratic state. It believes that Lebanon is a sovereign, free, and independent country, providing a permanent homeland for all Lebanese citizens. It believes in Lebanon’s territorial unity, its people and institutions and the country’s Arab identity and Arab affiliations. We believe that Lebanon is a democratic parliamentary republic, based on public freedoms and the freedoms of belief and expression. Lebanon is founded on social justice and the equality of all citizens before the law. The movement is deeply committed to democracy, respect for the Constitution, the rule of law and upholding human rights. It is equally committed to the peaceful co-existence of all segments of society and adheres to moderation as a method of reconciling differing beliefs and ideologies. It denounces all forms of fanaticism, sectarianism, insularity and is against the use of violence to resolve political differences. It believes in the freedoms of working people and the rights to political action. It supports all forms of freedom of opinion and expression, particularly freedom of information and a free media within the limits of the law. Economic freedom and openness are also at the core of the movement with private ownership and the free-market as its base. All regions have to be treated equally and according to need in any development plan. We believe in the state’s role in promoting social welfare, healthcare, education, and the care of our elderly. The movement believes in protecting the environment by promoting environmentally friendly ways of life among Lebanon’s citizens coupled with supporting and enforcing relevant laws. We believe in the equality of women and the need for them to play an effective role in wider societal and national revival. Women possess potentials and abilities that deserve to be expressed in, among others, the social, political and economic fields. An increased role for women gives all social forces a better chance of operating and interacting successfully in national development plans. The Future Movement represents youth, the spirit of renewal and the drive for modernization. As such the young are at the heart of all the movements’ policies, especially programs designed to prepare the young for future leadership. Founded on belief in Lebanon’s Arab identity, the movement believes that relations between Lebanon and Syria ‑ based on the mutual respect of the sovereignty and independence of each country ‑ are in the best interest of both countries. These relations are a political fact and are the result of long standing historical, geographical and demographic associations. Honesty, respect and co-operation must characterize them. They must also be protected from short-term political thinking and selfish personal agendas. The Future Movement believes that Lebanon must be open to co-operation with all Arab and non-Arab nations. Lebanon must establish foreign relations that enhance co-operation and dialogue and promote regional development, progress and prosperity. We are committed to a just and comprehensive peace in the Middle East recognized by international law. We believe in the legitimate right of the Palestinians to return to their homeland and categorically reject their permanent settlement anywhere else.